Trio in a Box, nylon Spinnaker, 2006. Max Streicher’s art is lighter than air. Okay, that’s literally not true. The work of this Toronto-based sculptor is decidedly comprised of stuff, made of things. It’s artefactual. It has weight and mass. So what I’m trying to employ, here, is a metaphor, for Max Streicher’s art is indeed lighter than air. All that being said, then, I also need to say that Streicher’s work definitely tends toward the large-scale. His pieces are enormous. But they really aren’t about their mass, which in any event is rather negligible rated against their scale. They are, though, all about volume – which is considerable. And most certainly about space. Oh, and they’re representational to boot. 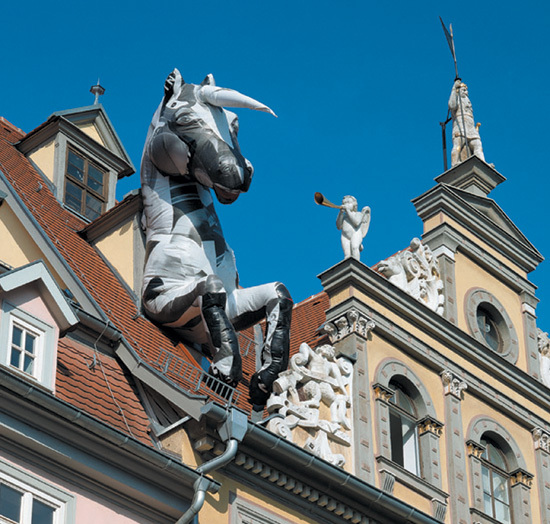 Stuck Unicorn, recycled vinyl, 2003. Kunstalle Erfurt, Germany. Photo courtesy of Kunsthalle Erfurt. 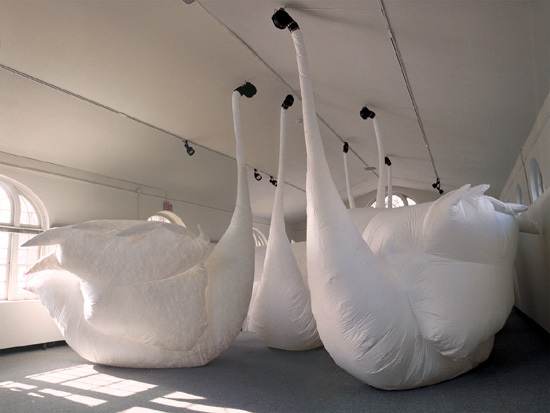 They’re inflatables, works temporarily shaping aesthetic space, objects blown full of air to give them momentarily important shape and volumetric substance. Like Lamentation, the first of Streicher’s works I saw firsthand back near the narrow end of the millennium. It comprises an installation of five enormous white swans made of Tyvek – you know, that white building material used to wrap the exteriors of the plywood shells of newly built homes just before insulation and siding are put up. Streicher used this stuff to fabricate the volumetric bodies of these sculptural creatures (as well as for many of his other works). And a “lamentation,” by the by, is one of the collective nouns used to describe a group of swans. Their long necks extend upward to the gallery ceiling, their heads actually the fans that keep these sculptural bodies inflated and fully volumetric. They’re surprisingly un-static; by switching the fans on and off causing the bodies to slightly deflate before reinflation, Streicher introduces motion in to the aesthetic scheme of things; these artefactual birds rub and bump up against one another, rocking slightly in the crowded confines of the space. In other pieces, motion is less of a concern. Maybe not surprisingly, Streicher has a thing for clouds, and has worked with them in a number of installations. Like with Architecture of Cloud, for instance, a piece, as it was installed at the Art Gallery of Hamilton in Ontario back in 2010, in which tendril-like cloud formations (again, made of Tyvek and given shape via electric fans) seemingly tumble down a gallery wall and onto the floor. 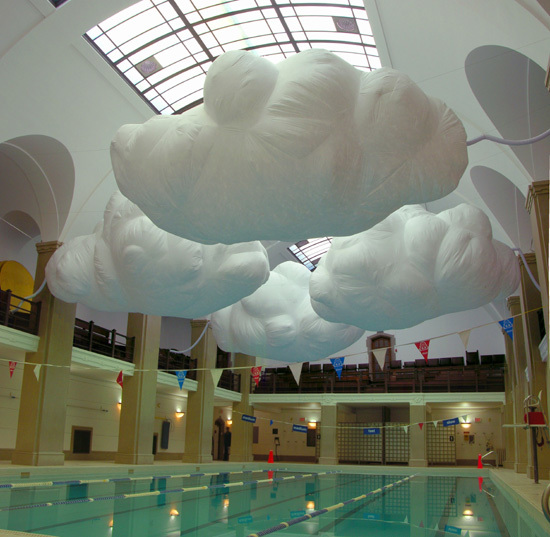 Or Alto Cumulus, another cloud work, this one brilliantly installed suspended above a university pool in Toronto. Or Cloud, a piece shown at the Art Gallery of Ontario and which comprised an enormous, soaring cumulus cloud and which was hollow within, permitting visitors to enter its interior space. Though representational, Streicher’s cloud pieces of course verge on the abstract. In a decidedly more representational vein, he’s worked with the figures of both animals and humans. Trio in a Box comprises three 1:1 scale human figures (fashioned of nylon), lying prone on the ground, legs splayed. From the navel of each extends a hose, all of which meet in a cardboard box set in the middle of the trio and in which is the fan that gives the work its literal shape, these figures their presence. Rather unnervingly (and unintentionally) akin to one of the rock band Pink Floyd’s inflatable pigs used during concerts, Stuck Unicorn is partial, the forward half of the mythical beast, emerging from (well, stuck in) a the rooftop dormer window of a lovely old German building, as if fully engaged in making the transition from the imaginary to the real, from the dream to a thing of substance and aesthetic wonder. Streicher, originally from Alberta, has been exhibiting work since the late 1980s after graduating with a Master of Fine Arts degree from York University in Toronto, and his entire career arc has been built around the possibilities of the inflatable. But what is aesthetically central about these pieces is the cognizance in them of entropy, of the third law of thermodynamics – essentially, that things fall apart, that all is, in a very real way, flux. Impermanence is a central truth that, as a species, we seem to rail against, and in a very real way, strive against with art, attempting to make permanence out of what is most decidedly transitory and ephemeral. We want to leave our mark. Max Streicher’s work (available at maxstreicher.com) will have none of it. The fans will shut down, the figures and shapes will inevitably deflate, becoming really little more than the disorderly skins of things, a heap of stuff with little aesthetic interest in and of itself. In a very decided way, the magic in his work is its ephemerality, and in a very decided way that’s precisely the point. Clouds disperse, people and horses pass away, unicorns exist only in imaginary ways…. The aesthetic point is powerful in the very fact of its transitory nature – intense and concomitantly fleeting.